Well, I didn’t even make it a week without missing a day. 😦 I don’t know why it is sometimes so difficult to get a post in, but yesterday was one of those days. First of all, my DD woke up sick – running a fever (well, really she went to bed running a fever and was still running a fever in the morning) and with a runny nose. So, I had to cancel our plans for selling nuts with the girl scout troop at Lowe’s, which was very disappointing to my DD. We also found out that my MIL has to go in for surgery (again…this is her third since the original surgery two months ago) on Tuesday, so we had to make plans for my husband being gone again (he just got back from a trip last Sunday). Luckily, our go-to sitter is available tomorrow and Tuesday because my DD is on short days for parent-teacher conferences this week, so tomorrow was going to be rough if she wasn’t available. So, yeah, yesterday, I just never got on to do the thankful thing. I probably really needed to considering the day. But, today, I’m back and I’m going to do two for the price of one! So, for Day 7 – I’m going to go with the Seven theme and say I’m thankful for our dog (whose name is Seven). Sometimes she is a total pest and she has chewed up a lot of stuff around our house in the eight and half months we’ve owned her. But, I really feel a bond with her. She is definitely “my” dog. She seeks me out and she listens to me (most of the time) when I tell her to do things. I love having a dog for multiple reasons, but the biggest one for me is really feeling safe. Because my husband travels so often and my DD and I are here alone, I would feel much more vulnerable without the dog here. And when someone new comes around (our neighborhod really – not just our house), she looks very, very scary! She is a sweet dog really and she has never threatened to actually bite anyone, but she barks like crazy and her hair stands on end and she LOOKS threatening. There have been some minor crimes in our neighborhood – cars broken into, someone walking off with something from an open garage and even a break-in next door (although, I think there were some ulterior motives for that that were unique to that house). So, I feel good about having a dog that is going to make a big stink if anyone comes in to our house unannounced. I also love her face. And now, on to Day 8. I am so very thankful for our preschool experience. My DD is now in First Grade, but her preschool teacher still babysits her quite often, we still are good friends with at least a couple of the families who were at the preschool with us and I feel that although my DD misses quite a bit of school because of illness, flu outbreaks, etc., she is incredibly successful because she was so well prepared through her preschool experience. I am so very glad we “found” the preschool (totally by chance really – it was a very small, relatively new preschool when I was looking and someone in my mom’s group had heard through the grapevine that it had a spot available). I put found in quotation marks because I really do feel like God had a hand in placing my DD there. I’ve grown up with pets. 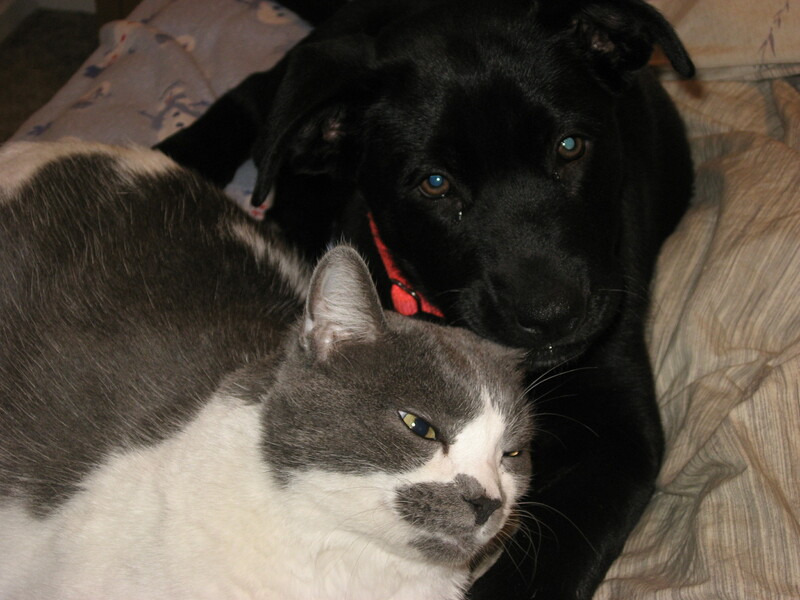 I’ve had dogs, cats, guinea pigs, iguanas, rats, hamsters, turtles…we’ve really run the gamut. But, dogs have always been my favorites. 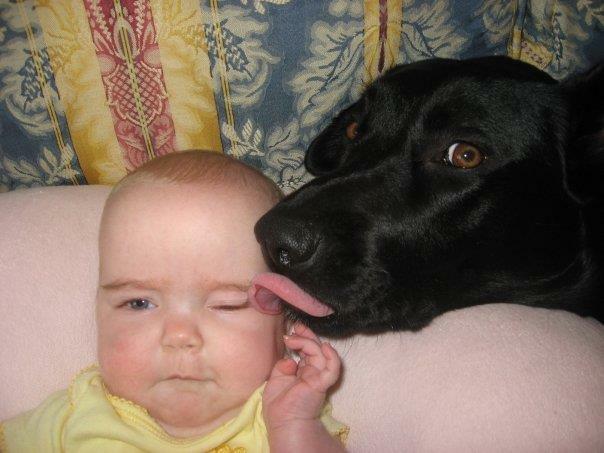 And I’ve had some fantastic dogs in my life, but Bella – pictured here with my daughter a few years ago, has been a special one. 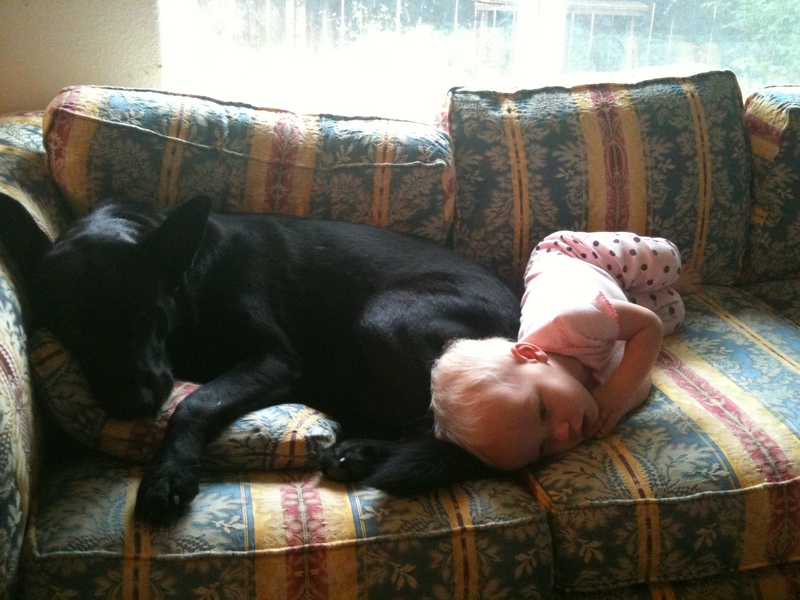 She is smart and sweet and totally protective of the little one there. 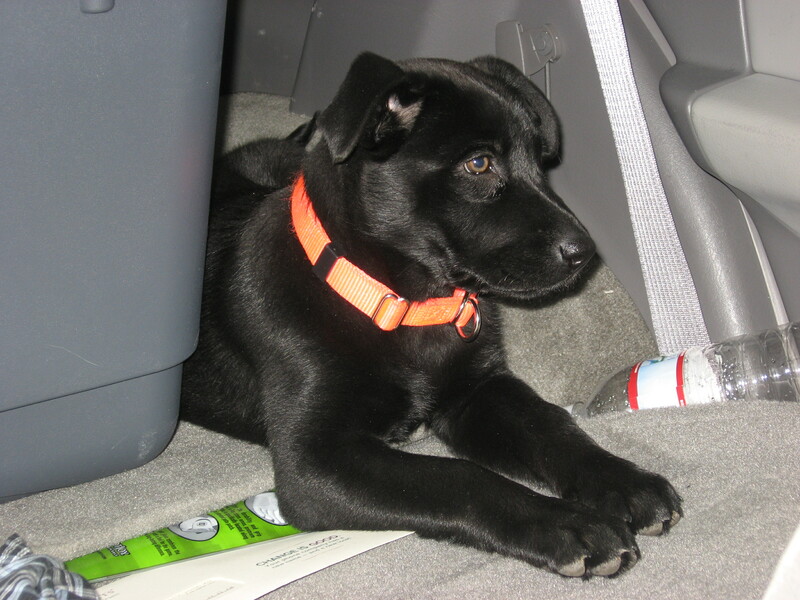 There she is when we first got her. She was a cute little puppy and I knew she belonged in our family when the cat would snuggle up with her and let her chew on her ears. She loved to go on walks, play with her toys and go for car rides. She still loves those things. A few weeks ago she started getting finicky about eating her food. I thought it was just her being spoiled. She would eat good stuff – cat food, chicken, table food, etc. but didn’t want to eat her dry food. Four days ago, she started vomiting. A lot. And pretty consistently. So, I took her to the vet. They ran some tests and $250 later told me that they couldn’t find anything seriously wrong with her. To take her home with some prescription IBS food and see if that helped. The next day, it was worse. We went back to the vet. She was now dehydrated and losing weight. They gave her a subcutaneous fluid treatment and me some meds to give her. That night she threw up twice. The next day she would not drink water. We went back to the vet. They admitted her and $1400 and 24 hours later we picked her up with a new thing of meds and instructions. Another 36 hours have passed since I wrote that. Another overnight stay. Another $1000. A couple of new meds and no new answers. And tonight, I flew to San Diego and my husband had to take her in at 3 a.m. to be put to sleep. She was suffering. She was not improving. We had done all we could. The next step was exploratory surgery of the abdomen despite the fact they could see nothing in the ultrasounds or X-rays that would be causing a blockage and the symptoms were not really blockage-like. Personally, I think she had cancer. They named it as a possibility the first time I went in, but said it was a small possibility. There was some abnormal appearance on the duodenum. When they said cancer, it just seemed to click. I hate that I wasn’t able to be there to say goodbye tonight. I hate that she only lived for seven short years. I hate that we didn’t do more with her – more walks, more swimming, more things she loved to do. But, we loved her lots. She slept with us, traveled with us. She loved Bean and protected her and worried about her. She loved playing with other dogs. I am going to miss her a ton. I’m incredibly sad that I was not there to say good-bye, but I’m more sad we couldn’t figure out what was wrong with her and fix it. But, sometimes, there is no fix. Sometimes there is no clear answer, only blurry choices seen through tears. I love you Bella. I hope you are playing in a big dog park in the sky and loving every minute of it. Tomorrow I will start the 21 Day Fix, or Beachbody program. I was brought to it by another heart mom and she has done great on it for the last four months. It was obvious from her posts how much better she was feeling and how much energy she has, so I decided to take the plunge. I looked into the program quite a bit and there are many things I like about it – first, the shakes are only a supplement, not a meal replacement. Second, it focuses on real food, which I like. It makes it more difficult, but it seems much more healthy than eating store bought bars and such. Finally, it includes the exercise regimen (via DVDs), which makes it easy to do. I love the containers for portioning. I love that you get to eat three meals and three snacks a day. I don’t love the low carb aspect because I love, love, love my carbs, but I do know that it is better for my body not to have all those carbs. I am sure the first few days to a week will be quite difficult. My diet has been horrendous lately. Processed foods and fast food all. the. time. Skipped meals. Barely any water drank. It will be quite the change for me. But, I think it will be good. I don’t even care about losing weight in all honesty. For me, it is about having more energy, feeling better and getting more fit so I can do more with Bean. I do a lot, and therefore I need a lot of energy. Lately, I’ve felt not just sluggish, but downright exhausted. Even when I sleep a decent amount. I have lots of aches and pains. I have no desire to go out and do fun things because I have no energy. So, that is what I’m looking for – a boost in my energy level and feeling more healthy and fit. Other than that, my dog is sick and the vet can’t figure out what is going on with her. After $660 they have diagnosed her with a slow-functioning duodenum that is causing bile build up and regurgitation. She was given a subcutaneous treatment for dehydration and a shot for nausea tonight. She seems to feel quite bad. I have multiple meds to give to her tomorrow to try to treat all the different things it could be – an antibiotic in case it is an infection, a dewormer in case that is causing the issue and an anti-inflammatory in case it is inflammation. I also am giving her something to coat her esophagus and stomach to keep acid from eating away at it and I have to give her pepcid to stop any acid reflux. So, with my daughter’s meds and the dog’s meds, I feel like I’m running some kind of infirmary around here. Seriously. But, I do hope this works to make the dog feel better. I love Bella and I don’t want her to feel miserable. It does make me realize what a bad dog owner I am, so part of what I would like to do during this 21 Day Fix is start walking her everyday for 15-20 minutes. But, not if she is feeling poorly. So, hopefully all these meds work and she will back to her old self and ready to walk, walk, walk! 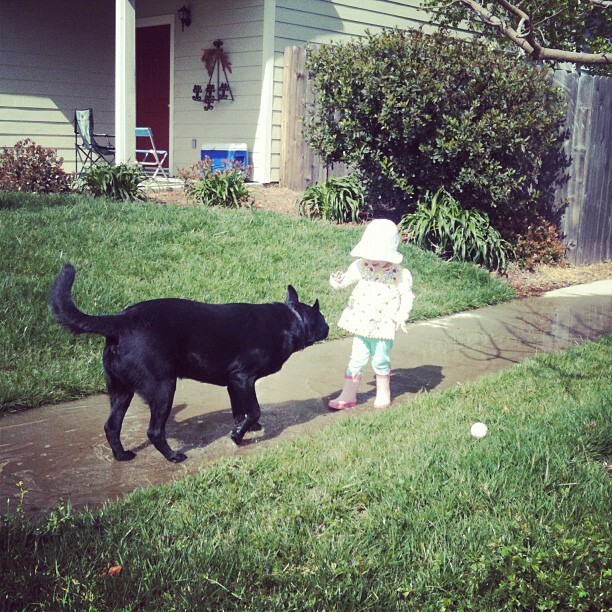 Dog and DD two years ago…hoping they will have many more days of fun together in puddles and sun!